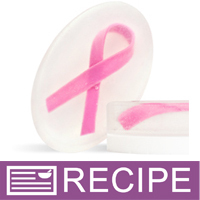 Support a cause by creating and donating these pink ribbon soaps. These fragrance-free soaps have a pink ribbon embedded in clear soap with a white background. Sell these to raise funds for breast cancer charity causes or sell them in October in recognition of Breast Cancer Awareness Month. COMMENTS: This was my first project as I am new to soaping. The directions were easy to follow. I made some mistakes and learned alot. I made half the batch and have plenty of products left over to make it again. I added glitter to the clear soap and a fragrance to both the clear and white soap. Looking forward to my next kit. COMMENTS: This is a great fundraiser kit. Very easy to follow and the soap is great quality. I like that the kit comes with everything you need to try it. You can also use the directions as a checklist of what to reorder.